Stay in style this summer with our Premium Velour Beach Towels. Choose from four select colors, Orange, Lime, Hot Pink, and Royal blue. Then let us personalize them for you! They will look great with a name or monogram. Make a fashion statement at the beach or at the pool with your personalized Bright bloom or Dream Dot beach bag with matching towel. Featuring a newly updated draw string closure and full sized 30 x 60 towel, everyone will be asking where you got it! 1000% cotton, draw string beach bag. 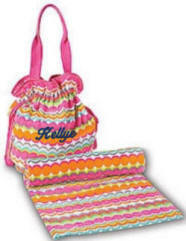 Personalize this beach bag with embroidery or a name or initials. Look perfectly coordinated pool side or on the beach. 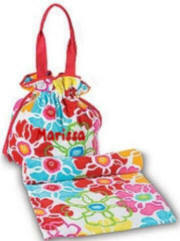 This matching beach tote and towel set can be personalized for an extra special gift. We monogram the tote bag with a name or initials in your choice of lettering. Two designs are available - dream dot or bright bloom.